Drawing of Saint Jeanne Jugan by Gerard Rooney. Mr. Rooney was an illustrator for The Pilot and a resident of Jeanne Jugan Residence in Somerville. 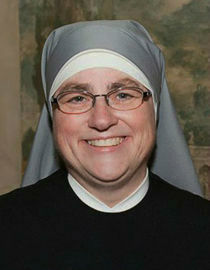 Photo Courtesy Little Sisters of the Poor. Our foundress, Saint Jeanne Jugan, was also known for her mantle, a black hooded cape which billowed in the Breton winds and under which she fingered her rosary beads as she traveled on foot seeking alms for the elderly poor to whom she had given a home. Superman has his red power cape. Elijah wore a cape to manifest his divine authority. Most famously, the Virgin Mary is usually portrayed wearing a cape-like garment known as a mantle, often blue and sometimes adorned with stars, to highlight her extraordinary role in history. In the Church's oldest Marian prayer we say, "Beneath your mantle we take refuge, O Mother of God." Medieval artists often depicted Mary under the title of Our Lady of Mercy, with her arms outstretched to reveal a crowd of tiny suppliants huddled in the folds of her mantle. All kinds of people found a place at Mary's feet -- from princes and pious nuns to slaves and peasants. In The Virgin of the Navigators, a Spanish work, Our Lady's mantle is full enough to envelope a whole armada of ships! Through these paintings, whether they were seeking refuge from pirates or the plague, medieval women and men expressed their faith in Mary's motherly protection and powerful intercession. Our Lady's mantle had a special significance in the New World too. As Mary appeared to Juan Diego in Guadalupe, she assured him, "Do not let your countenance, your heart be disturbed.... Am I not here, I, who am your Mother? Are you not under my shadow and protection? ... Are you not in the hollow of my mantle, in the crossing of my arms? Do you need anything more?" Mary explained to Juan Diego that a sanctuary should be built on the hill of Tepeyac so that she could demonstrate her merciful concern for God's people: "I will give Him to the people in all my personal love, in my compassion, in my help, in my protection," she told him. "I am truly your merciful Mother, yours and all the people who live united in this land and of all the other people of different ancestries, my lovers, who love me, those who seek me, those who trust in me. Here I will hear their weeping, their complaints and heal all their sorrows, hardships and sufferings." 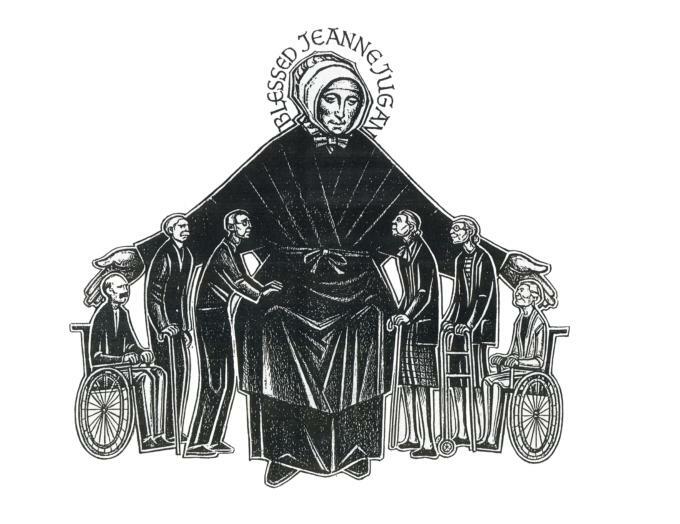 Our foundress, Saint Jeanne Jugan, was also known for her mantle, a black hooded cape which billowed in the Breton winds and under which she fingered her rosary beads as she traveled on foot seeking alms for the elderly poor to whom she had given a home. Perhaps finding inspiration in the traditional images of Our Lady of Mercy, several artists have portrayed Jeanne Jugan gathering the elderly under her mantle and holding them tightly to her breast. I find solace imagining those I love and care for sheltered in the folds of Mary's mantle, or nestled close to the heart of Saint Jeanne Jugan. But I also sense a challenge, and I believe that is why God has inspired me to contemplate these images, which manifest the powerful yet gentle and merciful love of God himself. I believe that God is calling the Church today, and each of us, to open our arms, reach out and draw all those on the peripheries of society into our circle of love. "We are called to bring to everyone the embrace of God, who bends with a mother's tenderness over us ... stooped down in a gesture of consolation," our Holy Father once said to consecrated women and men. These words of Pope Francis can motivate all of us. This is how we will be missionary disciples who bring the joy of the Gospel to the field hospital of today's world. Saint Jeanne Jugan's feast day is celebrated on August 30 and during these last weeks of summer we celebrate Mary's Assumption and Queenship, as well as her birthday. On these special days let's ask Our Lady and Saint Jeanne Jugan to teach us how to extend a mantle of compassion over wounded souls, creating -- and becoming ourselves -- sanctuaries of that powerful yet gentle love which animates the heart of Christ.